Go big. Instead of going with small bathroom mirrors above bathroom sinks, pick models that are bigger. Choose a mirror that stretches all the way from the floor to the ceiling, for example. 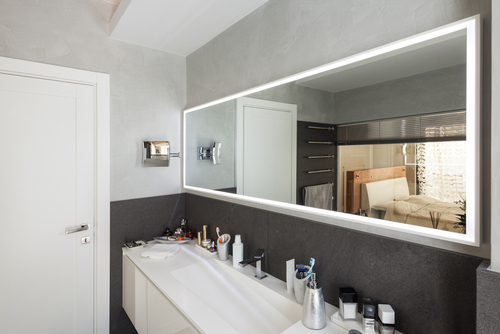 If you have double sinks, opt for one huge mirror that extends across both rather than small twin mirrors that break up the effect. Match the window. If one side of the bathroom has a window, consider hanging a mirror across from that window, on the opposite side of the room. The mirror will bounce natural light into the room, reflect views to the outdoors, and create the illusion of twin windows in the same space. Pair them. When you can’t put a mirror across from a window, try putting it across from another mirror. Two mirrors opposite each other can encourage the illusion of an endless space. In any case, always position a mirror across from something pleasant to look at (artwork, tile walls a window), rather than less-attractive parts of the space — like the commode. Make a mirror wall. Is there an open wall that you could turn into a mirror? As a design element in your bathroom, a mirror wall can expand and brighten the room’s overall look. Because it extends the full height of the room, it can make the space feel taller. Try framing the mirror with trim to make it clear that it’s a mirror and not part of a fun house, or consider using a collection of different-sized mirrors for a sort of gallery wall. Make it a focal point. Whether it’s through a beautiful frame, a unique style or a striking shape, try to make your bathroom mirror more eye-catching. Place it behind a light source to magnify the illumination effect in the room. When a mirror becomes a focal point, it draws the eye to the most expansive, light-catching part of the room, enhancing its sense of space. To make the most of a small bathroom, start with the mirrors. Use the five tips above to strategically place and use your mirrors in a way that brightens and enlarges your room. When you’re looking for the best in bathroom fixtures for your modern bath, come to Modern Bathroom. 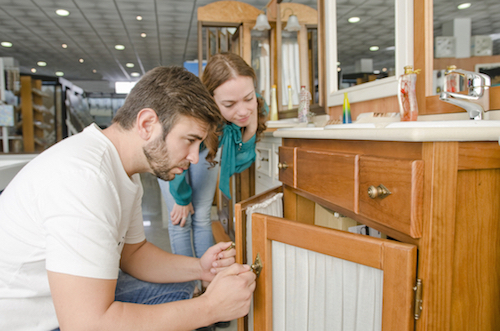 As the Internet’s leading provider of bathroom vanities and bath accessories, we’re your resource for everything from showers to mirrors — and at factory-direct prices that can save you up to 70 percent of typical costs. If you are working on a bathroom remodel and wondering what a true “must-have” is, here’s a tip: For a trendy shower remodel with some surefire staying power, consider adding glass shower doors. Moving away from an old-school shower curtain to the sleek and modern look of glass doors is a popular remodeling choice today — and with good reason. Glass doors expand the sense of space in the bathroom, they come in a variety of designs, and they cut down on water spills and maintenance work. A Larger Bathroom Feel: Because glass doors elongate the look of your room rather than boxing off part of the space, they can create a larger, longer feel for the whole room. There’s more room for light to bounce throughout the space, and you enjoy a more spacious, comfortable design. 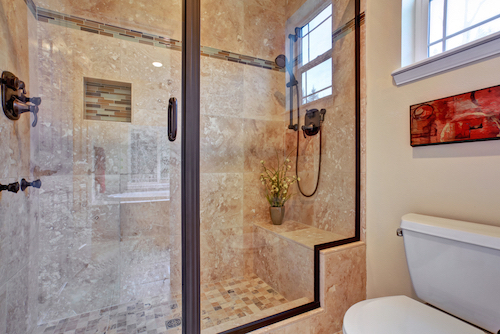 Showcased Shower Design: Let’s face it: The custom tile or stonework in your shower is too beautiful to hide. So instead of tucking it behind a shower curtain, use glass doors that let everyone get the full effect. Versatility: Because glass shower doors come in a variety of sizes and shapes, they can work in a wide range of bathroom designs. Whether your bathroom style is modern or traditional, you can find something that works for you. Likewise, you get to choose from small panels, doors, frosted glass, clear glass and more. Low Maintenance: While shower curtains tend to trap moisture, glass panels are easy to wipe, preventing the accumulation of mold and mildew. A low-maintenance bathroom feature that’s as beautiful as it is resilient? That’s a feature you can’t help but love. Less Water Spillage: Another big perk of glass doors is that they fully enclose the shower so that water can’t spill out onto the nearby floors and fixtures like it does with standalone showers. 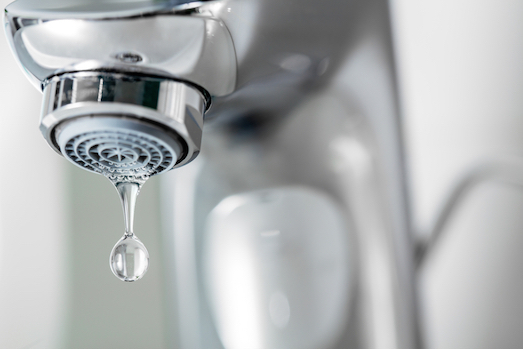 Keeping water inside the shower where it belongs helps you avoid unnecessary spillage and messes throughout your space. Reduced Slip-and-Fall Area: Shower doors minimize wet floors. The less wet the floor in your space, the less chance that someone will accidentally slip and fall. From easier maintenance to increased safety, glass shower doors are a bathroom feature with a lot to offer! So when you’re wondering how to up the value of your bathroom with a remodeling project, consider working this attractive, streamlined shower option into your new space. At Modern Bathroom, we offer a variety of shower doors/enclosures in our online catalog, all at factory-direct prices and with free shipping. What’s more, thanks to our 110 percent money-back guarantee, we’ll refund 110 percent of the difference if you find the same product anywhere else for a lower price within 30 days of your purchase. Search our website to learn more about our top brands, or contact us today with any questions.